Scott Hebert, co-leader with John Seltzer after 36 at the 2016 Michigan PGA. 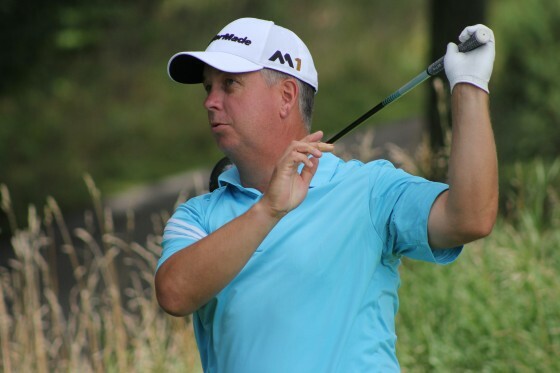 ADA TOWNSHIP – Seven-time champion Scott Hebert of Traverse City Golf & Country Club charged and John Seltzer of nearby Blythefield Country Club held steady. They shared the lead through two rounds of the 54-hole, $55,000 Michigan PGA Professional Championship at Egypt Valley Country Club Tuesday. Hebert shot 6-under 66, and Seltzer 69 to each land at 9-under 135. Josh Fryer of Franklin Hills Country Club matched Hebert’s 66 and was one shot back at 136. Chad Kurmel of the Spartan Academy in East Lansing, the 2012 South Florida PGA Professional Champion who moved to Michigan two years ago, shot 67 for 137. Kyle Martin of the Lochmoor Club in Grosse Pointe Woods, who grew up in the Grand Rapids area playing golf at Egypt Valley, shot 71 for 138. And three-time champion Brian Cairns of Fox Hills Learning Center in Plymouth, and 2004 champion Joe Pollack of Yamaha Golf Cars Plus in Plainwell each shot 72 for 141. The field of 119 was cut to 61 golfers after Tuesday’s round on the Valley course. The cut fell at 8-over 152. The final round Wednesday will tee off Nos. 1 and 10 with the leaders and final group of three golfers going off No. 1 at 9:21 a.m. The final round is on what is called the Tournament Course, which is the back nine of the Ridge and Valley courses. There is a lot to play for in the final round. The low 10 golfers, besides Hebert, a former PGA Professional national champion and exempt from having to qualify, will earn spots in the 2017 PGA Professional National Championship at Sunriver Resort in Sunriver, Oregon, next June. The low 20 finishers from that national event move on to play with the best players in the work at next year’s PGA Championship at Quail Hollow in Charlotte, N.C.
Hebert, 47, said he has had two good rounds at Egypt Valley with his ball-striking, but sour putting. His 66 included three consecutive birdies at Nos. 1, 2 and 3, as well as birdies at 8, 15 and 17. Seltzer, 37, said he had a good back nine (33), his first nine for the day, but stalled coming in on the front nine. Fryer, 41, said his 66 was mistake free. Fryer said he talked with his friend, former PGA Tour player Doug LaBelle of Mount Pleasant, on the phone after Monday’s round.